One might think that all caves have already been documented, but that would be wrong, wrong, WRONG. Seven decades of the NSS, 50 years of the MSS and a generation of organized caving in southwestern Missouri, and the job still isn’t done? Yep. Fact is, new caves are being found faster than they are being documented. With nearly 6,900 caves recorded in Missouri as of January 1, 2015, less than half have been mapped and even fewer have detailed reports in the files! And, no matter how much documentation there is, more is ALWAYS needed, so the opportunities for Joe and Jill Caver to make real contributions to the science of speleology are virtually unlimited. After all, documentation is really about saving caves and what’s in them. Who is going to care about a hole in the ground if no one has ever cared enough to write something—anything—about it? Fact is, the majority of landowners probably have never been in caves that they own, so it’s important to them to know that someone besides themselves think enough about their cave(s) to document them. Can documentation really SAVE caves? You bet! Riverbluff Cave was discovered during road construction, and likely would have been blasted shut had cavers not gone inside, and said, “Hey, wait a minute, this is an amazing place, and we need to save it!” Of course, caves as significant as Riverbluff are exceedingly rare, but we go caving because we love the thrill of discovery, of maybe pushing that grim, wet lead into something really incredible, a place never seen before. Unfortunately, most of the places we’ll visit are just ordinary, already seen by who knows how many people. Nevertheless, they’ll be interesting, and if they’re worth our time to visit, they are worth spending a little more time to document. Documentation can save caves in many ways. The presence of known, documented caves has saved many of them from destruction by road building, sewage lagoon and landfill siting, and just plain “development.” What’s more, if endangered species are found in caves, they will qualify for protection under federal law. Documentation is not just a chore one has to do, but a labor of love for the caves. DOCUMENTATION is a scary word. People look at it and say, “Oh, I can’t do that—I’m not a scientist!” But, the good news is, you don’t have to be a scientist—or engineer, or technical person of any kind. You just have to be willing to visit a cave and write down what you see. Now what could be so hard about that? START WITH THE LOCATION: Say you’ve found a new cave, and you want to tell where it is. If you have a GPS unit (and know how to use it), you’re home free. Or maybe you have a topographic map and know how to mark the exact spot where the cave entrance is, and then use one of the location systems to describe it—latitude/longitude, section, township and range, or UTM. But, these systems can be tricky, so if you’re not comfortable using them, just tell where the cave is by the “pirate” system: “Follow the gravel road to a sharp curve, climb the red gate, and walk downhill toward a big oak tree…” You get the idea; just tell as clearly as you can how to find the cave. TELL ABOUT THE ENTRANCE: In a bluff? In a sinkhole? In a creek bed? On a hillside? How wide? How deep? Is it easy to spot, or do you have to search for it? Does water flow out or in? What is unique about it? The entrance is the first part of the cave one sees, so it’s important to tell others how to recognize it, especially if there are other caves nearby. If you can, do a sketch. DESCRIBE THE CAVE BEYOND THE ENTRANCE: Just tell what you see as you explore the cave. Is it wet? Dry? Walking passage or crawlways? Do you need ropes or other rigging? Does it flood in rainy weather? Spot any cave life? Graffiti? 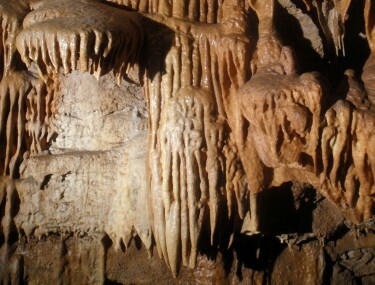 Speleothems (formations)? Are there side passages? How long is the cave? (Guesses are fine, if it hasn’t been mapped yet). You can be as brief or as verbose as you like, depending on your personality and training. It’s important to remember that you are who you are, not someone you might like to be, so your cave documentation will naturally be different from others who may visit and write about the same cave. Different, but just as important! Very few cavers are like the legendary Lang Brod, who wrote long, elegant and highly detailed cave reports. Yet even his reports are not the final words about a cave; it will change over time, and other people will see things that Lang missed. So don’t be intimidated—describe a cave as YOU see it, and I guarantee that your work will be appreciated! DON’T FORGET PICTURES AND/OR DRAWINGS: They say a picture is worth a thousand words, so take lots of pictures! Cave photography has changed a lot since the days when Roy Davis used flash powder to illuminate Cumberland Caverns. Shucks, these days you can just use your cell phone! And, if you have any artistic talent at all, do drawings of cave features. Drawings can often depict things that cameras cannot, so use all of the tools available to you to convey information about the cave. MAPPING IS IMPORTANT: Mapping is probably the most important part of documenting a cave. Oh, you don’t do maps? Maybe you can persuade others to take on that task, perhaps with your help. Again, you don’t have to be a professional engineer to do cave maps. You can learn by doing, and who knows, some day you may become so well known that people will recognize your maps by their special style, just as they recognize paintings by Picasso or sculpture by Michelangelo. A good cave map makes it possible to compare a cave with other caves, and provides a graphic framework for the word-pictures that describe a cave.